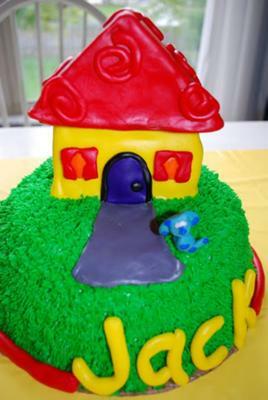 This Blue's house cake was constructed out of several yellow cakes. The hill was carved from three round cakes and then frosted with buttercream, dyed green, applied with a grass tip. The main part of the house was constructed of cake and covered with homemade fondant dyed with yellow. Parts of the house were constructed from red, orange, purple and black fondant. The roof was made from cardboard and covered with red fondant. All other decorations were made of fondant, including tiny Blue.